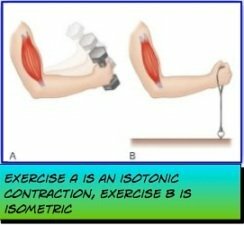 Isometric-Isotonic Contractions - What Is The Difference? Many people are confused about isometric-isotonic contractions. What exactly are the differences between the two contractions and what are the advantages and disadvantages of each? Exercises which utilize isotonic contractions are typically the exercises that everyone is aware off. Swinging a bat, throwing a ball or lifting a weight are all isotonic movements. Most of the bodyweight exercises in "Natural Fitness" and "Animal Workouts", not to mention "Power Isotonics", are Isotonic in nature as well. Anatomy wise, an isotonic movement is one in which a muscle is shortened and the body part it is attached to moves as well. If you perform a bicep curl, the process of shortening the bicep is what moves the arm. Isometric Contractions, on the other hand, are situations where the muscle TRIES to contract, but cannot. An example of this is if you tried to lift an immoveable object. Holding a weight at arm's length would be another. Actually, the legendary Bruce Lee, who was famous for his isometric workouts, did an exercise like this. He would hold a 3 pound steel ball in front of him with a straight arm for as long as he could. When he couldn't stand it anymore, he would drop the weight into the opposite hand and repeat the movement. He would alternate back and forth like this for 8 hours. This is obviously an extreme example, but that's also why the Dragon was the Dragon. 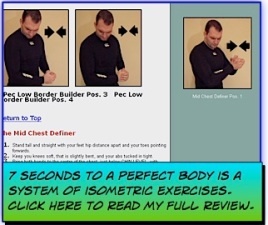 Exercises based on Isometric-Isotonic contractions have their benefits. However, Isotonic movements typically are much more vigorous, which is better for the heart. Isometrics only work the heart indirectly. Due to their vigorous nature, isotonic exercises are usually better at burning calories and therefore greatly aid in weight reduction. Most people don't realize that if you eat an extra 100 calories a day, that can add up to 10 pounds a year. Walking for an hour (an isotonic exercise) will burn this off. The primary benefit of isometric contractions is that they work muscle fibers that would otherwise remain idle. They are able to do this as isometric exercises (when done properly) force ALL of the muscle fibers to become fatigued. In weightlifting terms, they "allow you to get to the last rep first." They also take less time to perform that isotonic exercises and may also do a more efficient job of building and toning muscles. They are also safer can be done anywhere, which makes them more convenient. Isometric-Isotonic contractions have their benefits. In the end, you will have to decide what your fitness goals are to determine which one is best for you. In my opinion, a balanced exercise program should contain both contractions, which is what I do. If you are looking for a great program of bodyweight isotonic exercises, be sure to check out the Animal-Kingdom-Workouts Value Pack. If you found this exercise to be helpful, help me spread the word by using these cool social network buttons below. Thanks!